Desert Racer: The latest pain theory. It’s almost 5 months since I picked up a mystery injury, on the long stage of the Atacama Crossing in Chile. I realise I’ve been describing it badly, as a ‘stomach’ injury, when’s it’s nowhere near in reality. It’s groin pain; I get pain just above my pubis bone, where my rectus abdominis attaches, almost central, slightly to the right. I get this pain for a few days following even a short run, and during a run over 10 miles. I can’t get to anywhere near 20, it’s too debilitating. Even walking is a problem after this many miles. The following morning I’ll have pain that last a few days, noticeable turning over in bed, sitting up from a lying position, especially if I twist slightly to the left. It also most worryingly twinges when I sneeze, and the term “right ball ache” applies both figuratively and literally. I have this pain pretty much all day, every day. No amount of treatment of rest or treatment is making this go away. I reached my tipping point this week, and yesterday phoned up and booked a same day slot on an MRI scanner. Last time I had an MRI it resulted in a confirmation of a meniscus tear and subsequent operation on my left knee. This time I was dropped a good deal deeper into the MRI scanner to scan my groin area. There I lay motionless for 20 minutes, as the machine buzzed away and did it’s thing from all the different angles. 45 Minutes afterwards the Radiologist saw me in his office, and went through the film which they produced to a CD, with the Siemens software which you can zoom through the ‘slices’. Much as I expected he said you don’t have a full-on hernia. Given I haven’t got a tell-tale bulge in the area, this was a given. 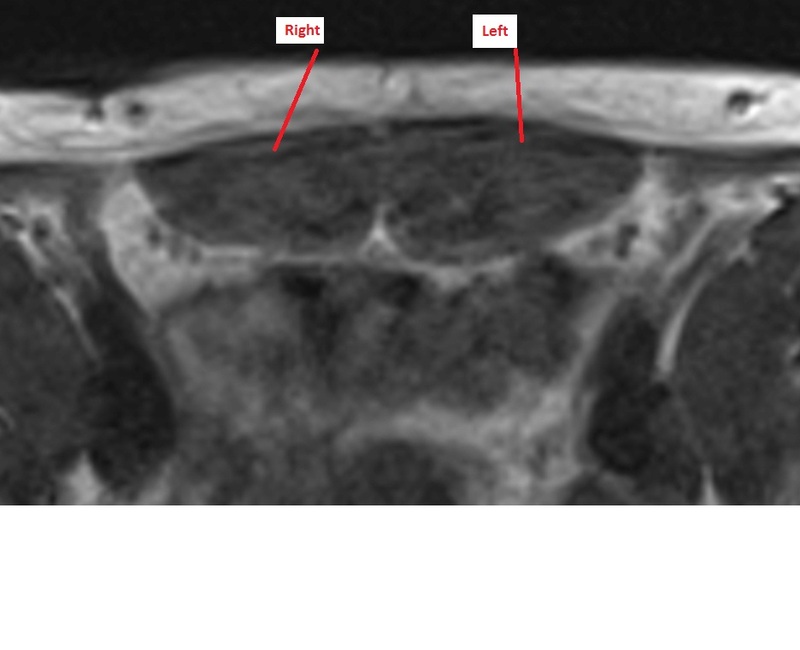 However, he did say I had lost muscle mass on the right side of my rectus abdominis.ou I think this MRI slice shows it. To orient you, this view is me sliced in half, viewed from my feet end. The top of the picture is my tummy, the bottom of the picture is chopped off, but it did show the cross section of my spine (a circle from this angle). The two areas I have indicated are my left and right rectus abdominis muscles. You should be able to see the difference in size. This difference can be indicative of a tear that has been present for a while If I understood correcttly. He also then also showed me a bright area of activity on one side of the film, not present in the other, where the muscle joins the pubis bone. He said this could be indicative of micro-tears, which is what I was concerned about. I can't locate this on the film to show you a picture. One day's practice doesn't make me a talented MRI scan evauluator I'm afraid. He then went onto say the words I was worried about which were, it is a possible indication of Gilmore’s Groin. Gilmore’s groin doesn’t really show up on an MRI, but an MRI is used to rule out other causes. It's as much a clinical diagnosis as one gained from tests. It’s also referred to as Sportman’s Hernia, or athletic pubalgia. It’s not a traditional Hernia, though can later develop into one if left untreated. It could also be something else, there might be another reason for all the symptoms, I just don’t know yet. I’ve now got to see a consultant for diagnosis, and potentially more tests. I went home and did what most others would and googled Gilmore’s Groin, for it to read like my life story for the last few months. I hope I’m wrong and it’s something else. Prognosis is that physiotherapy to strengthen core muscles has a poor success rate, and usually an operation is required to repair all elements of the issue, usually involving attaching a mesh to strengthen the area. The condition and surgical procedure was pioneered by a London-based Surgeon (Gilmore) who is a Harley Street Doctor. The condition usually affects high level athletes, typically in Soccer and Hockey, where twisting and turning is involved. Clearly running doesn’t sound like a candidate, but I do have a complication of a pelvis which is almost permanently tilted and rotated, I’m theorising here that could be the ‘twist’ factor, if any further investigation reveals this to be the likely cause of my pain. Quite a few well known footballers (Liverpool and Real Madrid) are documented to have both had and recovered from this condition following surgery. I hope it’s something else to be honest, I type this as another sneeze gives me another sharp twinge of pain. I hope it’s something else, or at worst that a core strengthening regime can fix it. I don’t want an operation. I had the last one under local anaesthetic as I was too scared to have a general. There is no escaping a ‘general’ to repair this one, so I’m desperate to get a different diagnosis. I’ve now got to weight up my options and wait for advice on who I should see for a diagnosis. I have no idea if a regular consultant will be specialist enough, or I have to see the Harley Street Clinic. For those who don’t know, Harley Street is a famed London street that has all of the doctors, plastic surgeons that are used by the rich and famous. These are some of the country’s top consultant’s, and as a result carry a very high price. I’m not sure even an hour long consultation is within my budget to be honest. So, I’m fairly miserable at the moment, just sick of being in pain to be honest.